Before we hit the highway from Riga to Limbaži—armed with maps, ancestor charts, old photographs, and our Latvian survival dictionary—we had no idea if any Jurikas descendants still lived in the area. In fact, we didn’t know if we could locate the erstwhile farmhouse or identify it from a 75-year-old photo. Or if it indeed still existed. Jürri (Juris) Jurikas moved his family to Krūmiņi farm on the Lāde estate near Limbaži about 1857. We presume this was to assist his sister Kadri whose recently deceased husband, Pēteris Lipsbergs/Lisbergs, had had the farm management right. So brother Jürri soon assumed that role. Later, mild land reform in the 1870s forced the landowners to allow peasants to buy a small portion of their estates. At that time Jürri's son Jahnis (Janis) Jurikas acquired the deed to Krumiņi, a property of slightly more than 27 acres. Old maps indicate the farm was about five kilometres south of the town of Limbaži. Exploring the town was its own interesting experi-ence, but we had more on our agenda. We headed for the small Orthodox cemetery. Thanks to some expert assistance ahead of time, I knew approximately where to look for my Jurikas family. It was a national clean up day across the country and a few people were moving about here and there in the cemetery; we had seen numbers of them picking up trash from highway ditches (maybe that’s why the town was so deserted-looking!). They were sprucing up plantings on individual gravesites. Quite apart from an annual clean up day, cemetery care in Latvia is largely a family responsibility. In rural areas especially, care extends from preparing the body of the deceased to digging the grave. Ancestors are honoured with plants and flowers (artificial flowers are disdained), evergreen boughs protecting them in winter. Families regularly come to visit, bringing their children to help. Small tools, decorative items, watering cans, and containers were evident in every cemetery we saw. Sometimes a small seat or bench has been installed for comfort. “You are my cousin!” I burst, commenc-ing to babble until his blank face stopped me. There we were: standoff. No English on one side and no Latvian on the other. What to do but pull out the family chart and with my assistant handling the dictionary department, show him that his mother and my mother were first cousins. He showed me his mother’s grave in a different section. His son was with him. They understood we were from Canada and mentioned a cousin who went to Edmonton. But the strangeness persisted — no smiles, no shared excitement, no animation. As we fiddled with cameras and before we could ask a million more questions, the two left. Went away across the field. Perhaps he was more stunned than I was. My cousin Janis Krastiņš. The oldest Jurikas burial plot has markers only for Jahnis and his wife Katrina Tukkums. I can but speculate on the additional two graves, for example, the deaths of his parents are not accounted for yet. One looks like it could be a child. Jahnis and Katrina’s children all died elsewhere except their son Janis whose daughter Tekla married Imants Krastiņš, and thus that family carried on with the Krūmiņi farm. This group is buried separately. Many of the Tukkums family rest here as well; they lived on a neighbouring estate. Onward we went, lamenting the unasked questions, to search for the farm. The unpaved roads were liberally pot-holed and muddy from rain that morning, giving our driver serious reservations about a potential wild goose chase. However, having memorized the 1937 photo and on the alert for a certain road junction, we navigated the few miles. Slowly. And voilà. Not so difficult after all.Especially with the Krastiņš name right there on the mailbox. Paldeis (thank you)! You can see the house has changed a good deal. Here we met another teenage son of my new cousin, who was almost as shy as his father. His uncle lives here; Janis and sons live in Limbaži. A good end to a very interesting, sometimes strange, often rewarding day. Photography credits April 2013 CDM, CBM, BDM. When you read about the magnificent Russian Orthodox Cathedral of Riga having been turned into a planetarium by the Soviets it could break your heart but for the meticulous restoration completed since the 1990s. Surely my family members who migrated to Riga worshipped here in the late nineteenth century. 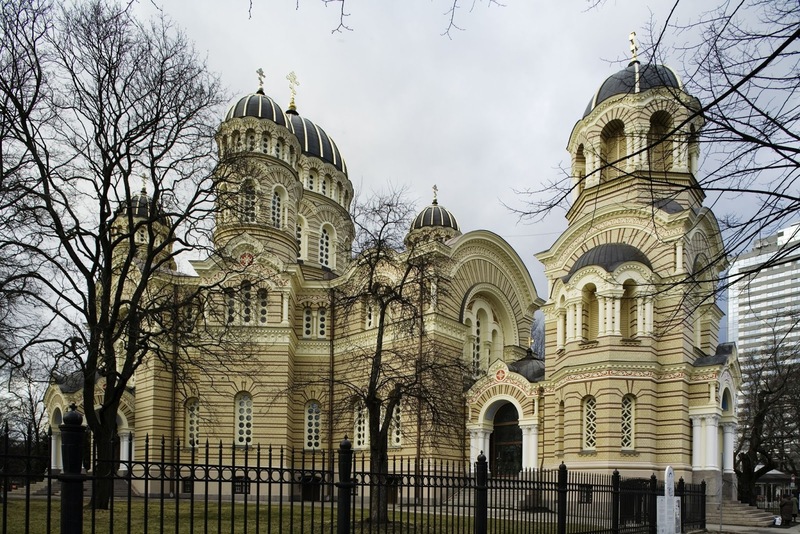 The Orthodox church had established its first presence in Riga around 1836, becoming a full diocese in 1850. I begin with that image because my Jurikas family was among the estimated 100,000 Latvian and Estonian peasants who in the late 1840s abandoned the prevailing Lutheran faith for Russian Orthodoxy. To oversimplify, it was a form of protest against the Germanic landowners who were Lutherans. "The now standard explanation for this astounding occurrence stems largely from two aspects of the era that have yet to be explored deeply with respect to the conversions. Namely, the conversions took place during a period of agricultural crisis and amid a series of rumors that suggested conversion to “the Tsar’s faith” would yield worldly benefits: freedom from manorial authority, land to be held without obligation, tax relief, and so on. "While the agricultural situation and rumors are not to be ignored, I suggest that excessive attention to these factors has led scholars to emphasize credulity and desperation at the expense of discussions of peasant behavior amid a period of social contest. Evidence of peasant claims and acts of disobedience – in particular illegal departures from manors and false complaints about religious persecution – need to be integrated into the study of the conversion phenomenon." 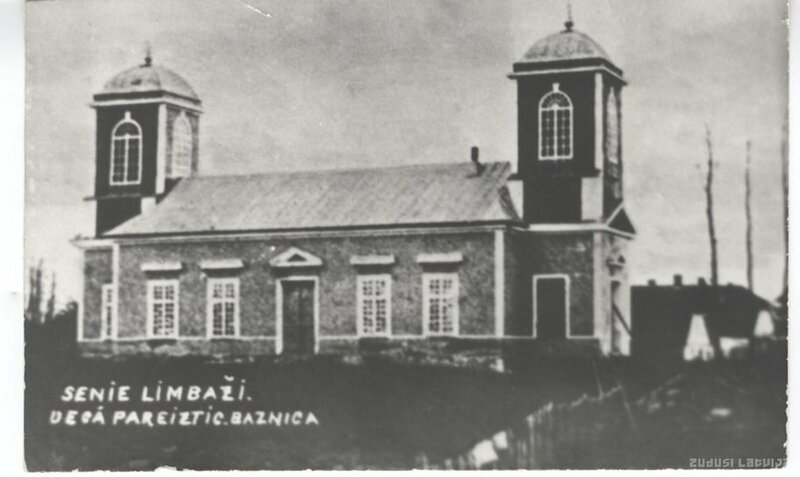 Lutheran church, Vecsalaca estate, Salaca parish; from 1833 to 1842 my Jurikas ancestors attended here, in the town of Salacgriva. Photo CDM April 2013. Therefore the conversion by my great-great-grandparents, Jaan (Jahn, Janis) Jurikas and wife Liso Riis, was not a singular or unusual act. The Baltendeutsche nobility controlled most of the land tilled by Latvians; each estate, also known as a manor, had many farms upon it. Land ownership entailed authorization from their Russian overlords to act as local magistrates, thus dispense justice. For instance, whipping was a common punishment for peasant misdemeanours and there were plenty of both complaints and whippings in the nineteenth century. 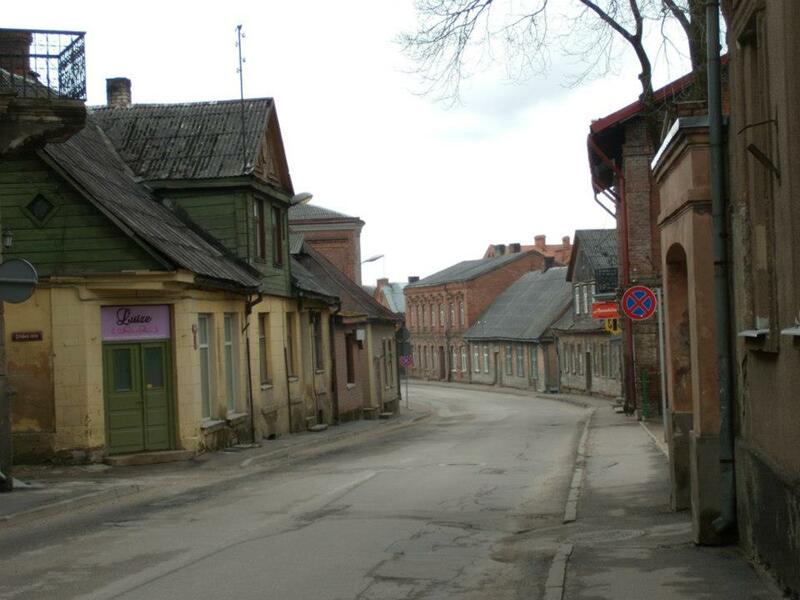 Genealogical research in Estonian and Latvian records shows that Jaan and then his son Jürri (Juris) moved family five times from one landlord's estate to another between 1823 and 1857. So it's quite possible an "illegal departure" (maybe more than one!) was involved along the way. According to the family story, Jaan was sentenced by the manor landowner to be whipped; he fled the estate to find refuge in the Orthodox church. The incident probably occurred when the family was living on the Lahze farm, Pāle estate, Limbaži parish. St Katherine Church, Vilkene, Pāle estate; this is the last Lutheran church in which family baptisms took place (1843); photograph BDM April 2013. We were able to follow part of the Jurikas trail, at least from the time they entered Latvian "territory" from what is now Estonia. Jürri finally settled at Krūmiņi farm, Lāde estate, Limbaži. More on this, next episode. And so Limbaži became their closest town. This is the town's lovely little Orthodox church, as pretty as something out of a fairy tale. But ... this is not where Grandma Marija and her siblings were baptized. Not exactly. This church was built on the same spot a few decades later in 1903. 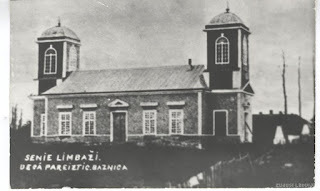 Thanks to this site ("Lost Latvia") we can see what the original church looked like. The town of Limbaži was quiet on a Saturday except for the museum volunteers tending a cooking pot over a fire where we were urged to partake of a delicious barley "porridge" topped with a tasty meat stew. It truly hit the spot after miles of navigating back roads. We explored the ruins of the castle built by Albert, Bishop of Riga, at the beginning of the thirteenth century and saw something of the local museum offerings. SO quiet we wondered where all the people were! The few we did meet were ever so friendly. But we still had two more quests to undertake before the day was over. Please do come back again for a final post on Latvia. Back to my original digression. Restoration of important historical buildings in Latvia has proceeded at an amazing pace since independence was again established in 1991. To me it's astonishing that so much has been accomplished out of the Second World War ruins and damages of the Soviet occupation. Documents, plans, and descriptions of destroyed heritage buildings were available to recreate them. In many cases it's not the first time. Some churches and other landmarks dating from the thirteenth century have been reconstructed several times over, after war and fire devastation. 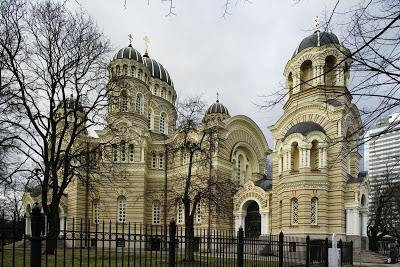 “The Latvian Orthodox Church,” Orthodoxy in America (http://www.pravoslavie.us/LatvianOrthodoxChurch.htm : accessed 2 February 2011). Bruno Martezans, “Conversion of Latvians to the Orthodox Church,” Roots=Saknes (http://www.roots-saknes.lv/Religions/Conversions.htm : accessed 18 January 2011). Daniel C. Ryan, “Rumour, Belief and Contestation Amid the Conversion Movement to Orthodoxy in Northern Livonia, 1845-1848,” Folklore: Electronic Journal of Folklore, Vol. 28 (2004 (http://www.folklore.ee/folklore/ : accessed 18 January 2011); published by Folk Belief and Media Group, Estonia Literary Museum.